Today is not only the posting day of us Bread Baking Babes but also World Bread Day. To honor this day we invited our faithful Bread Baking Buddies to bake and post with us on this day and I have to say I am curious who has followed our invitation to bake this lovely bread with us. 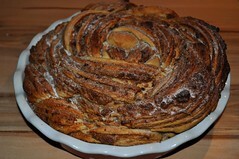 As for World Bread Day: If you are looking for a lot of yummy breads you just have to jump over to Zorra's Kochtopf. She is hosting the World Bread Day event again and I bet there will be a lot of heavenly breads in her round up during the next days... thanks Zorra for hosting this lovely event every year! 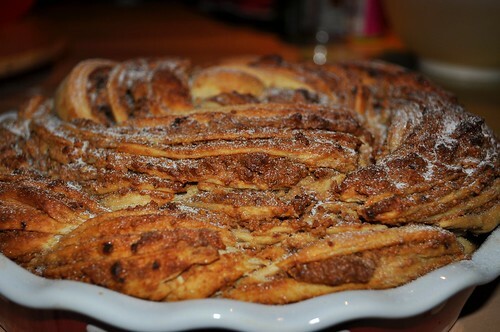 Now to this month's bread: Tanna is our Kitchen Mage of the month and not only chose this lovely recipe but also gathered us around her virtual kitchen table and invited us to bake with her. Originally this bread was filled with a savory filling and I bet this lovely bead would taste great with pesto and all sorts of savory fillings your mind can come up with. I personally decided to go with a sweet version instead because I wanted it to use as breakfast bread and I am not a big fan of savory parts in my breakfast. If you are baking this bread with us - and I highly recommend that you do so - let your mind fly free and come up with any filling that fits your gusto :) you will love it anyway! I also played with the flours used in the recipe and went with a mixture of white spelt and millet flours. The suggested canola oil was partly replaced with walnut oil because I thought this would add an extra nice nutty flavor to the dough. Set oven to 210c (410F) Prep: Baking Pan - 26cm (10") springform (no bottom), take a piece of parchment paper and crimp tightly around the bottom of the springform, oil the sides. Place on top of a baking sheet. Set aside. Add all ingredients to a mixing bowl, add the water carefully as you start mixing. Use the dough hook 2-3 mins. on low speed and 2-3 mins. on medium speed. Dough should be supple and not sticky to the touch. Add water or flour if dough is too stiff or too loose (respectively). When dough is ready, spray a bowl with oil and gently put the dough in the bowl. Spray a little more oil on top and cover. Let rise (80%) about 40 minutes to an hour. Lightly flour your work area. Flatten the dough gently with your hands. Roll the dough as thin as you can using a floured rolling pin. When rolling out the dough, try not to lift and move it too much. 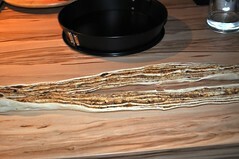 You can try and gently pull the dough to stretch it thin like with Strudel. 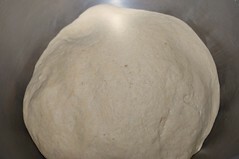 Apply a thin layer of your filling on top of the dough (leave the edge clear 1/4"). 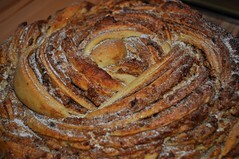 Slowly, tightly and very gently roll the dough into a roulade (pinwheel ). You will now have a very long roulade. Take a sharp chef's knife (not a serrated knife) and cut (not saw) the roulade lengthwise trying to keep the knife in the middle so you end up with two equal parts (you can cut down from the seam but it is not make or break). Place the two halves crossing each other (open roulade layers facing up) to create and X shape. Gently pick up the two ends of the bottom half, cross them over the top half, and place them back down. 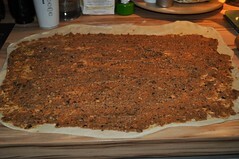 Continue this process, taking the two bottom ends and crossing them over the top until all the roulade has been used. You now have a two strand rope shape. If for some reason some of the open roulade layers are pointing down or sideways, carefully turn them so they are facing up. Gently pinch the ends to seal. Look at the braid. If one end looks a little thinner make that your starting point. If not, just start from either end. Slowly and very gently, roll the braid sideways (horizontally) without lifting your hands from the table. You should keep those open roulade layers facing up. Pinch the end delicately. 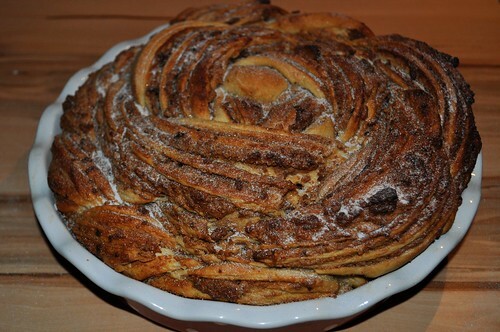 The end result should look like a giant snail shell or a very large cinnamon bun. Depending on your filling you may want to sprinkle on something (paprika, sumac, brown sugar & cinnamon). Keep in mind you don't want to cover up the effect of the shaping. Carefully pick up the braid and place in the prepared springform. Keep it flat on the parchment. The bottom of the braid should set nicely. Cover. Let rise until the braid hits three quarters the way up the springform. Depending upon the temp in your kitchen this may take from 20 to 40 minutes. Bake at 210c (410F) for 5-10 mins. lower oven to 180c (355F) and bake for another 20-30 mins. There should be a decent amount of oven spring. 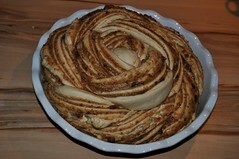 The bread should rise above the springform edge. When the bread is out of the oven lightly brush olive oil or butter on top and sides. Let cool on a rack. You are welcome to bake this with all white flour or any combination of you like. My changes reflect an attempt to incorporate more whole grains; at some point I will probably try this with some rye flour. Beautiful loaf Astrid! So smart to use the walnut oil to flavor the bread, too. Leaves me wanting to bake this bread again...in the sweet version(s). Very pretty.... I'm getting very, very hungry! O I soo like your rose, it's real pretty. And that filling... yum yum yum, delicious. Your loaf is gorgeous...but then this really lends itself to gorgeous which is why I love it. So when I make my cinnamon iteration I'll use walnuts, walnut oil, cinnamon & brown sugar. Reminds me of Hamburgs Franzbrötchen.